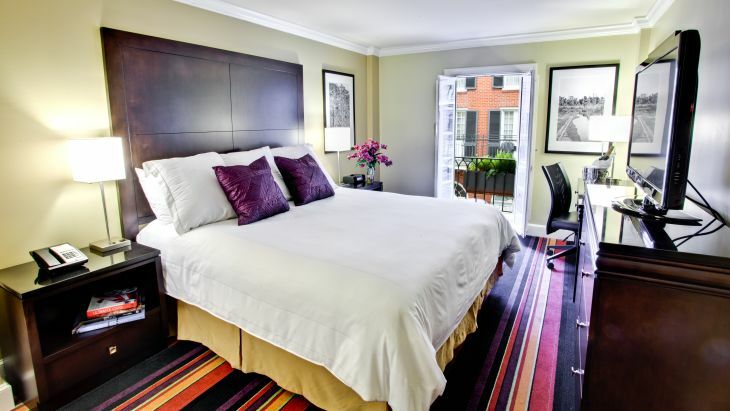 Reminiscent of mid-century Paris, each Premium guestroom features a wrought iron balcony that opens to a vibrant view of the French Quarter or a quaint brick courtyard that perfectly sums up Southern charm. Plush pillow-top beds with fine thread count linens and waffle cotton robes ensure sweet dreams. While 42-inch flat screen TVs, work desks and ergonomic chairs, and blazing fast WiFi keep you as connected as you want to be. More appointments include a red leather reading chair, coffee maker, granite countertops, and luxe bath amenities.